Nigerians woke up on the morning of Wednesday, 8 June 2016, to the shocking news of the demise of former skipper and coach of the Super Eagles Stephen Okechukwu Keshi. As tributes continue to pour in. From around the world for the departed football hero, Complete Sports‘s JAMES AGBEREBI, lists SEVEN memorable moments Keshi had with the Super Eagles. After several attempts the Super Eagles finally secured a ticket to the FIFA senior World Cup which was hosted in USA in 1994. Key to the Eagles qualification for the World Cup was Stephen Keshi, who featured in six of the eight qualifiers (4-0 home win against South Africa, 0-0 away draw against South Africa, 1-0 away win against Congo, 2-1 away loss to Cote d'Ivoire, 4-1 home win against Cote d’Ivoire and 1-1 away draw against Algeria). And in the decisive away game against Algeria which ended 1-1, Keshi marshaled the Eagles defence, displaying his leadership qualities and wealth of experience as Nigeria finally earned a place at football’s biggest showpiece. Nigeria won the Africa Cup of Nations in 1980 on home soil after beating Algeria 3-0 in the final. But in Cote d’Ivoire 1984, Maroc 1988 and Algiers 1990, Nigeria got to the finals but finished second (Keshi featured in the 1984 and 1988 editions). 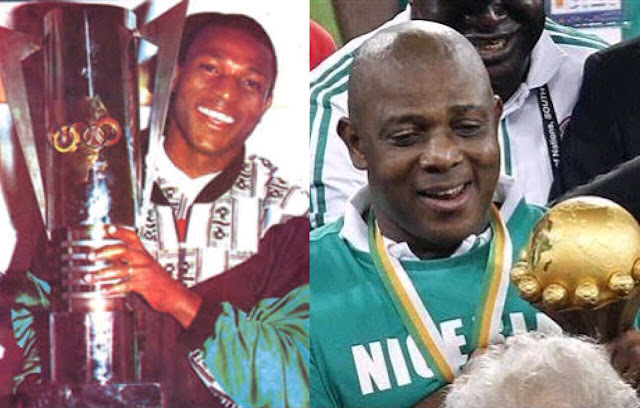 All that heartbreak was to change in 1994 in Tunisia as Keshi led Nigeria to her second African title. He played two games during the tournament, the 3-0 win against Gabon and the semi-final win against Cote d’Ivoire. Keshi became the second Nigerian coach, after Amodu Shuaibu, to qualify Nigeria for the FIFA senior World Cup, when the team earned a place in Brazil 2014. Under the tutelage of Keshi ,the Eagles pitted in Group F along with Kenya, Malawi and Namibia in the second round, finished top of the group with 12 points. Qualification for the 2014 World Cup was finally sealed when the Eagles defeated Ethiopia 4-1 on aggregate in the play-offs. Keshi achieved a feat no Nigerian coach had never achieved, winning the Africa Cup of Nations in South Africa in 2013. After the Eagles failed to qualify for the 2012 AFCON in Equatorial Guinea and Gabon, Keshi took over and was saddled with the responsibility of qualifying for the next edition which he accomplished. And to the surprise of all, 17 of Keshi’s 23-man Eagles squad (aside from Vincent Enyeama, John Mikel Obi, Elderson Echiejile, Austin Ejide and Ike Uche) were making their first ever appearance at AFCON. The Eagles were eventually crowned champions for the third time after beating Burkina Faso 1-0 in the final. With that feat, Keshi’s name also got into the history books as the second African born coach, after Egypt’s Mahmoud El-Gohary, to have won the Africa Cup of Nations as a player and as a coach. The Eagles faced hosts Senegal in the opening game of the 1992 African Cup of Nations. Samson Siasia put Nigeria ahead before the late Jules Bocande drew Senegal level following a mistake by Keshi. But Keshi made amends for his earlier mistake by scoring the winner, netting a left-footed screamer, to give Nigeria a 2-1 win. After missing the first two editions of the African Nations Champions in 2009 and 2011 in Cote d’Ivoire and Sudan respectively, Keshi led the home-based Eagles to the 2014 edition in South Africa for the very first time. To secure a place to the 2014 CHAN, the home-based Eagles overcame Cote d’Ivoire 4-3 on aggregate in the final round of the qualifiers. Despite losing 2-1 to Mali in their first game, the home-based Eagles went all the way to the semi-finals where they lost to Ghana on penalties. In the third place match, the home-based beat Zimbabwe 1-0 to pick up the bronze. Prior to the Super Eagles group games at the Brazil 2014 World Cup, the three-times AFCON winners victories at the senior global tournament came under Clemence Westerhof and Bora Milutinovic (Westerhof, USA 1994:3-0 against Bulgaria, 2-0 against Greece and Milutinovic, France 1998: 3-2 against Spain, 1-0 against Bulgaria). But against Bosnia-Herzegovina, a goal from Osaze Odemwingie, secured a 1-0 win for the Eagles and also their fifth overall since making their debut in 1994. The Eagles went on to qualify for the second round alongside Argentina where they lost 2-0 to France.